HacDC's Prusa Mendel 3D OLDER Printer. 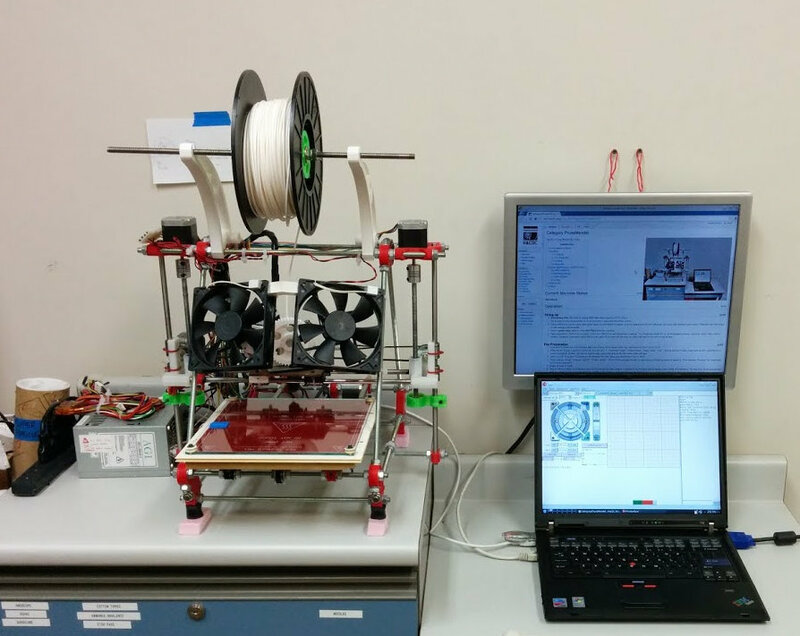 This is NOT the only Prusa Mendel machine currently in the space! Operational most of the time, continues to require occasional maintenance. Serves as an excellent 'school' for teaching the basics of making, maintaining, and designing robotics. Ask Julia Longtin for details. Emergency Stop. Be ready to unplug USB cable when beginning X/Y/Z motion. Go through the routine maintenance list as necessary, especially the safety section. Check which bed you are using. Bare glass highly recommended for quality, extreme warp prevention (hot adhesion), and easy part removal (cold release). Polycarbonate and heavy acrylic surfaces also available. Turn on power strip. Switch on the ATX PSU behind the machine. Open pronterface. Connect to the printer. Check box "Watch" to see temperature readings. You should see about 20C on all temperature sensors, and basic stats in the console window. Optionally, set heated bed to 65C for bare glass. If you don't do this now, the printer will wait for the bed to heat up later. Load an STL model onto the dedicated laptop for printing. If you haven't made one, download one from Thingiverse. Clean the STL model. Load file in nefabb, click the red "+", "Automatic repair", "Default repair", "Apply repair", "Yes" - remove old part. Finally, export part as STL, repairing more errors if prompted. Netfabb can also be used to align a particular face on the 3D model to the print bed. Open Slic3r. Drag your STL file from a file manager onto the "Drag your objects here" box in Slic3r. "Print settings: Cheap" "Filament: HacDC" "Printer: HacDC" . Chose "Print settings: Quality" for ultra-strong mechanical parts (ie. gears) or "Print settings: Precision" for small parts at 75 micron resolution. Wait for Slic3r to finish. In pronterface, load the G-Code file you have created. A preview of the first layer should appear in the middle of Pronterface. You can click on the preview and walk through the layers by holding shift and scrolling on the trackpad. In the console (not the bottom bar), an accurate time estimate for the print should also appear. For printing off the uSD card (highly recommended), you've two options to upload the file to the Melzi. The first option, and slowest, is to use Pronterface to upload the gcode via the "SD->Upload" option. I do not recommend this method for large files as it can forever to do so, for small files, it may be acceptable. For large files, remove the uSD card from the Melzi, and use the USB uSD adapter in the top drawer of the desk to load your file onto the card. You can copy the file directly from Slic3r, but you *MUST* give the file an 8.3 compatible filename. Reinsert the card into the Melzi and restart Proterface. DO NOT TOUCH THE GLASS BED! Your finger smegma will cause your print to lift. And will cause the next users to do the same. Scrape the bed with a razor blade (usually easiest to hold it with a pair of hemostats) and then clean the glass bed well with Windex before and after every print. Check the print head, the nozzle should be clean. If there is any build up of material on it, heat the nozzle via Pronterface, and wait until you can *very* carefully wipe the nozzle clean with a paper towel. The nozzle will be very hot. Check that the bolts holding the bed all have double nuts on them. Sometimes the nuts will work themselves loose during a print, causing the bed to shift. If they are loose, lightly retighten and tighten the double nuts. You will have to relevel the machine now. Check the level of the bed before every print. First, home the Z-axis. While this is happening, eyeball the surface of the bed, the nozzle should *not* flex the bed when it completes a homing cycle. Ideally, the nozzle should be just touching the bed. Now pan the head back and forth across the X, while again looking directly across the surface of the bed. You should not see the bed flex or move while panning, nor should you see any gap between the bed and nozzle change across the axis. Do the same for the Y-axis at the edges as well as the center of the bed. Once again, make sure you can push X and Y axes to their endstop switches without bumping anything. Also make sure there is not more than 1mm of ooze sticking out of the nozzle to avoid crashing the extruder into the bed. Click the "print" button. If printing from the uSD card, select "SD -> SD Print" and chose you file. WARNING: when printing from the uSD card, you *cannot* pause the print from Pronterface. If you do, the printer will actually pause, but the gcode will continue running in background, so when you resume, you will have skipped printing some of your print. WARNING: when printing from the uSD, do *not* connect/disconnect from the printer with Pronterface. This will stop the print. Wait for bed to cool. Part should lift right off the bed once cool. If not, apply gentle hammer taps with sharp pointy tool to the base of your object. After a few gentle taps in various places, it will pop off the bed cleanly. Carefully, please avoid chipping or cracking the glass. Please update the PrusaMendel Operators Log. Power Supply. NEVER leave ATX power supply on after leaving HacDC, it gets hot. X/Y endstops. Manually push X/Y axes to test the switches. Make sure the extruder and bed are positioned not to bump anything when homing. Z-axis endstop. Visually check that it will trigger before severe crash into print bed. Also trim excess cold plastic ooze on the nozzle, and remove ooze from bed, if necessary. The blue wire cutters are typically the best tool for this. Lose bolts. In particular, check the endstop bolts. Loose wires. Short circuits cause severe damage. Bare glass bed must be extremely clean. If bed is level to within 0.25mm, and plastic is not sticking, it needs cleaning. Take glass to sink, apply dishwashing soap, sponge, and elbow grease. Blue paper tape may be used on any print surface. Surface adhesion is more predictable. Downsides include the need to occasionally replace the paper tape, and lack of cold release. Plastic (acrylic/polycarbonate) bed should be kept flat, without excessive protrusions. Scrape excess plastic off, and trim deep cuts. First-layer depth. Extruder should just barely touch the surface, Slic3r will move the extruder the correct distance from that position for the first layer. When quality is paramount, placing the extruder just above the surface is to prevent curling is acceptable. When adhesion is paramount, it may be acceptable to drive the extruder 0.2mm into the bed, though quality for the next few centimeters will suffer as a result. In pronterface, home the Z-axis, then manually jog 0.1mm to verify these distances. Ideally, the margin for error is minuscule, ~0.1mm . Z-axis level. The dual threaded rods must be kept aligned. Do not rotate them manually unless it is obvious someone else has done so. Bed leveling. Simple alignment problems can be solved by cautiously adjusting the four screws. Remember glass will not tolerate significant pressure in addition to thermal stress. More complex warping problems are corrected by a somewhat complicated process, involving a 3D printed and heat-polished leveling mat. See PrusaMendel_Print_Surface . You are adding to the workload on a shared machine. Please be gentle. NEVER leave ATX power supply on after leaving HacDC, it gets hot. NEVER heat the bed without temperature sensor in place. Avoid moving X-Axis >195mm from home position. Avoid ramming the hot-end into the screw protruding at far-right corner of the bed. Leaving hot end on without extruding (ie. pooling hot plastic) for more than a few minutes can damage it. Removing parts from glass bed before cooling completes, or getting fingers on the bed leaves residue and necessitates cleaning. For plastic print surfaces (acrylic/polycarbonate), don't set the bed too warm, or the printed part will be non-removable. Free of charge for dues-paying members using reasonable quantities of filament (<0.5kG or <50m per month average). Newcomers to the space are freely invited to lightly use the 3D printer use for small projects, or education. Non-members regularly using the 3D printer are politely requested to donate approximately $0.50 per meter of filament, as estimated by pronterface when loading g-code. If the printer breaks dramatically while you are using it, don't fret. We have replacement parts, budget, and talent to repair it. These supplies and others, are funded by membership dues when revenue exceeds operating expenditures (ie. rent), according to Project Awesome rules. This page was last modified on 15 June 2015, at 08:42.